The two species in the family are large (P. massyae 72 cm ML; P. adami:78 cm ML) but moderate to somewhat weakly-muscled squids. P. adami has been reported to be common in the Gulf of Mexico (Voss, 1956) and is fairly common in the slope water of the North West Atlantic to at least New England (MV, pers. observation). P. massyae is thought to be cosmopolitan in tropical and temperate seas. 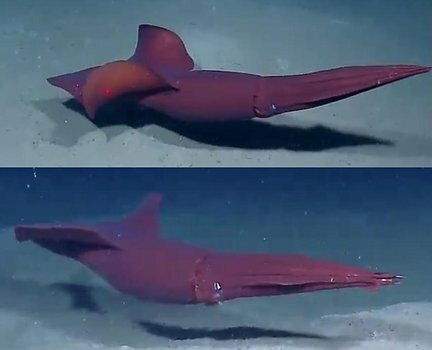 Squids from different oceans, however, have not been closely compared. with elongate tentacular clubs lacking a locking apparatus. with dermal cushions or papillose tubercules. Arms with biserial suckers present; hooks absent. Long, slender clubs, only slightly expanded. Length of manus ca. 2 times length of dactylus. Locking-apparatus absent or greatly reduced. See P. massyae page. Small flaps with short membranes present near bases of lateral club suckers (=abortive trabeculae ? ); flaps not attached to protective membrane (see arrows in photograph below). Figure. Oral-lateral	view of a portion of the club of P. massyae stained with methylene blue to show the small flaps. Note the large, flat trabeculae that extend nearly to the margin of the protective membrane. More information on the tentacles can be found here. Conspicuous dermal cusions or papillose tubercules present (see species accounts). The gladii are very different with P. adami having a secondary conus and P. massyae having apparently a primary conus and very differently shaped vanes. P. adami has large fins and long arms and P. massyae short fins and short arms. The two species look very different, but the nearly identical tentacular clubs, which are very peculiar, clearly indicates close relationship. Two genera have been placed in this family: Tetronychoteuthis and Pholidoteuthis. Pfeffer erected the genus Tetronychoteuthis in 1900 based on a specimen he incorrectly thought to be Onychoteuthis dussumieri Orbigny, 1839 but was actually a specimen of Tetronychoteuthis massyae, a species he described in 1912. Onychoteuthis dussumieri Orbigny, 1839, however, is a species of Onykia (formerly Moroteuthis) (Onychoteuthididae) (Roper and Lu, 1989; Nesis and Nikitina, 1990). Pholidoteuthis was erected by Adam (1950) for his new species Pholidoteuthis boschmai. Nesis and Nikitina (1990) demonstrated that Adam's species and that described by Pfeffer as Tetronychoteuthis massyae belong in the same genus. They considered Tetronychoteuthis to be a nomina dubia, leaving Pholidoteuthis as the valid generic name. According to Roper and Lu (1989), the case must be referred to the International Commission on Zoological Nomenclature. More recently O'Shea, et al. (2007) placed P. boschmai as the junior synonym of P. massyae. A list of all nominal genera and species in the Pholidoteuthidae can be found here. The list includes the current status and type species of all genera, and the current status, type repository and type locality of all species and all pertinent references. Adam, W. 1950. Un cephalopode nouveau: Pholidoteuthis boschmai gen. Et sp. Nov. Koninklijke Nederlandse Akademie van Wetenschappen, 53: 1-8. Pfeffer, G. 1900. Synopsis der oegopsiden Cephalopoden. Mitt. Hamburgischen Zoologische Museum.17: 147-198. Goldman, D. A. 1995. A juvenile of the scaled squid, Pholidoteuthis adami Voss, 1956 (Cephalopoda: Oegopsida), from the Florida Keys. Proc. Biol. Soc. Wash. 108: 136-146. Nesis, K.N. and I.V. Nikitina. 1990. Revision of the squid family Lepidoteuthidae. Zool. Zhurnal, 69: 39-49. Orbigny, A. d'. 1834-1848. In: A. de Ferussac and A. d'Orbigny. Histoire naturelle generale et particuliere cephalopodes acetabuliferes vivants et fossiles. Paris. Roper, C.F.E. and C.C. Lu. 1989. Systematic status of Lepidoteuthis, Pholidoteuthis and Tetronychoteuthis (Cephalopoda: Oegopsida). Proc. Biol. Soc. Wash., 102: 805-807. Roper, C.F.E. and C.C. Lu. 1990. Comparative morphology and function of dermal structures in oceanic squids (Cephalopoda). Smithson. Contr. Zool., No. 493: 1-40. Sweeney, M. J. and C. F. E. Roper. 1998. Classification, type localities and type repositories of Recent Cephalopoda. Smithson. Contr. Zool., No. 586 (vol. II): 561-599. Voss, G. L. 1956. A review of the cephalopods of the Gulf of Mexico. Bull. Mar. Sci. Gulf Carib. 6:85-178. The high resolution image (ie, click on image) shows the diagnostic dermal cushions. Dr. Mark Benfield, Louisiana State University. Page: Tree of Life Pholidoteuthidae Adam, 1950. Pholidoteuthis Adam, 1950. Authored by Michael Vecchione and Richard E. Young. The TEXT of this page is licensed under the Creative Commons Attribution-NonCommercial License - Version 3.0. Note that images and other media featured on this page are each governed by their own license, and they may or may not be available for reuse. Click on an image or a media link to access the media data window, which provides the relevant licensing information. For the general terms and conditions of ToL material reuse and redistribution, please see the Tree of Life Copyright Policies.